Urethane Wiper Blades – Polyurethane Wiper Blades! Urethane Wiper Blades ? You’ve come to the right source! 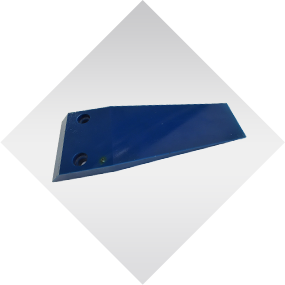 Urethane Squeegee Blades: Urethane squeegee blades are found in many material handling systems that consist of material processing. When the products are required to stay clean this is when urethane squeegee blades act like a wiper to help clean away debris such as rock, gravel, sand, stone, and other substances processed on conveyors that can create material build up. 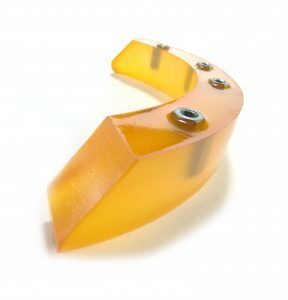 Bolted to the application they are easy to install or replace existing urethane squeegee blades. Urethane Conveyor Belt Scrapers: Urethane conveyor belt scrapers are found in many conveyor belt systems that consist of material processing. When the products are required to stay clean this is where urethane conveyor belt scrapers will help clean away most debris such as rock, gravel, sand, stone, and other substances processed on conveyors that can create material build up. Often times urethane conveyor belt scrapers are bolted to the conveyor’s exit drive wheels to wipe the roller clear of large debris to protect the conveyor belt and rollers. Urethane Fan Screw Shoes: Urethane fan screw shoes are found in bulk aggregate handling systems in extreme abrasion conditions. Bulk handling systems are typically constructed with a corkscrew roller that will process material forward or backward depending on the rotation of the urethane fan screw shoes. Some equipment will have multiple fan screws to move a larger amount of material. Urethane Slurry Wipers: Urethane slurry wipers are found in many production tank systems that are capable of processing a liquid material. Urethane slurry wipers are required to wipe the tank or pipe clean to keep any contaminants from entering the next batch of material to be processed. Polyurethane slurry wipers also can have a core molded into the part for easy bolt-on applications. Urethane Belt Wipers: Urethane belt wipers are found in many conveyor belt systems that consist of material processing. Custom urethane belt wipers are great to help clean away debris such as rock, gravel, sand, stone, and other substances processed on conveyors that can create material build up. Bolted to the conveyor they are easy to install or replace existing urethane belt wipers. With our team of engineers and chemist’s, we can also match your existing custom urethane wiper blades perfectly often times costing less than OEM replacements. Conveyor Belt Urethane Wipers: Conveyor Belt Urethane Wipers are found in many conveyor belt systems that consist of material processing. When the products are required to stay clean this is where conveyor belt urethane wipers help to clean away moist debris such as rock, gravel, sand, stone, and other materials that are processed on conveyors. Conveyor Belt Urethane Wiper Blades are bolted to the conveyor and they are easy to install or the existing conveyor belt urethane wipers can be replaced. Custom Urethane Wipers: Custom Urethane wipers are found in many material handling systems that consist of material processing. Custom urethane wipers help clean away debris such as rock, gravel, sand, stone, and other substances processed on conveyors that can create material build up. Bolted to the application urethane wipers are easy to install or replace existing wipers. Other common custom urethane wipers applications will consist of an ID thru-hole where the wiper will be placed over a cable or fixture. Urethane Scraper Blades: Urethane Scraper Blades are large metal bars commonly coated with urethane to produce a soft blade to redirect product off a roller or to simply keep the roller clean while it process’s material. Other types of urethane scraper blades are on a much smaller scale and can be easily cut at Plan Tech’s state of the art machine shop equipped with water jet cutting capabilities. 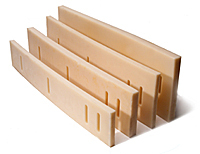 Urethane Belt Scrapers: Urethane Belt Scrapers are a critical cast urethane part that Plan Tech manufactures for any application. 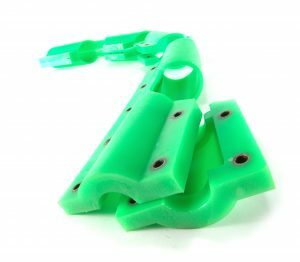 Many different profiles and shapes are available from OEM catalogs which Plan Tech can reproduce or make custom one off urethane belt scrapers to meet and exceed any required fitment. Urethane belt scrapers are typically located at the exit of a conveyor belt system mounted underneath the shoot. There are numerous types of conveyor belts that handle a diverse amount of materials such as FDA dry food products and mining material slurry systems. The printing industry also uses urethane wiper blades for many different uses on printing machinery in special applications. Cast urethane wiper blades are flexible, non-corrosive, non-marking, chemical resistant and can withstand continued service under some of the most demanding conditions. The urethane wiper blades have a temperature range of up to 170°F. Urethane wiper blades can be cast made of solid urethane or bonded to a variety of materials. The urethane wiper blades typically have a hardness or durometer range from 60A to 75D depending on the flexibility needed for the application. Polyurethane has unique characteristics and a high resistance to abrasion or chemical degradation. A low durometer will keep the urethane wiper blades flexible while allowing the blade to act like a squeegee and move liquid along efficiently. Also, a much harder durometer can be used giving urethane wiper blades the capacity to push material down the conveyor line or to change the direction of material. Urethane can typically last a lot longer than rubber even in most abrasive applications plus we have a full line of urethane additives to enhance your urethane wiper blades performance! Most polyurethane wiper blades are designed where one side of the blade has a relatively beveled skirt. These skirts can be produced up to 48’’ long with beveled edges typically from 45° down to 20° this will allow you to choose the skirt that lays flatter and provides the best seal for custom cast urethane wiper blades. How To Make Urethane Wiper Blades! Please Contact us for further details on regarding Urethane Wiper Blades!